Cloudy skies early, then off and on rain showers overnight. Low 48F. Winds WSW at 10 to 20 mph. Chance of rain 70%..
Cloudy skies early, then off and on rain showers overnight. Low 48F. Winds WSW at 10 to 20 mph. Chance of rain 70%. Two hard winters in a row has weakened the health of the Northern Range elk herd that is divided between Yellowstone National Park and the southern end of Park County in Montana. Fewer young bulls are recruiting into the northern Yellowstone elk herd this year based on counts conducted by biologists in March. Elk calves are born in June. Trends for the Northern Range elk herd, which is divided between the north portion of Yellowstone National Park and Montana's Paradise Valley and Gardiner Basin, is slightly increasing but fewer young animals are being counted. Hunter success for 2018 has not yet been calculated because elk shoulder seasons delay calls to hunters until after February. An annual report detailing a March 17-19 aerial count was released Thursday showing the population was holding fairly steady at about 5,800, but calf-to-cow ratios have been low and many animals appeared to be in poor health. “We are probably going to see a little bit of a decline,” said Karen Loveless, a Fish, Wildlife & Parks wildlife biologist based in Livingston who helps conduct the counts. Most of the Northern Range herd — 75% this winter — continues to migrate out of the park, a trend that has remained high since 2011. Typically that migration to areas like the Gardiner Basin and Dome Mountain Wildlife Management Area is a trip to a place with less snow than they would encounter in the park. That wasn’t necessarily the case this winter. About 2 feet of snow fell in mid to late February in the Paradise Valley. Under its management plan FWP tries to keep livestock and elk separated, either by utilizing herders to move the elk out of ag fields, by calling hunters to kill animals or issuing kill permits to landowners. With so much snow Loveless said there was nowhere to push elk off of ag fields. What’s more, the elk were in such a weakened state that even shooting cracker shells at their feet didn’t prompt them to move, she said. Last year's elk survey showed significantly more animals — up about 2,200 animals from 2017. 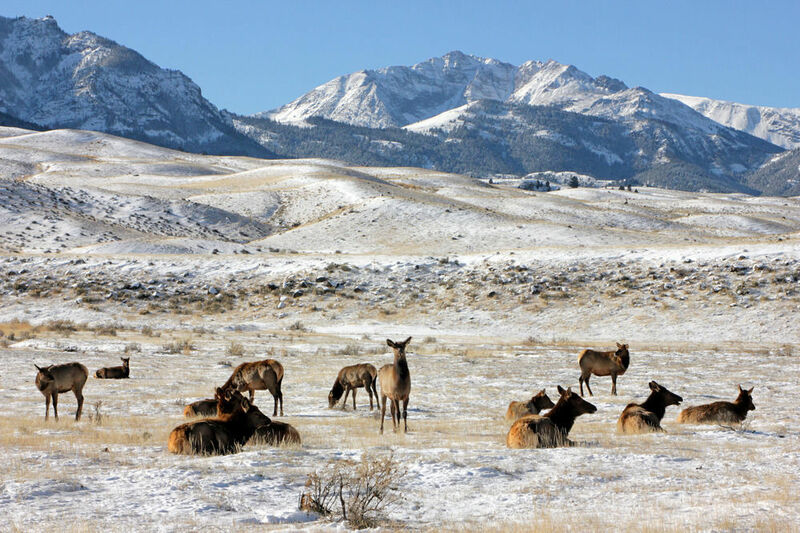 The theory was that elk that traditionally migrated to Wyoming from the park in the winter were blocked by early snow and instead were diverted to the Paradise Valley. “Maybe this year more stayed and last year they got pushed down,” Loveless speculated. The total elk count in 2017 was about 5,300 animals. This year the count was 5,800. So trend-wise the herd seems to be increasing if last year’s high count of 7,500 elk was a fluke. One asterisk to the numbers is that in past years the government agencies that cooperate on counts make two flights — one by airplane and the other by helicopter. This year because of the federal government shutdown only one flight by helicopter was conducted. Helicopter flights, because the craft are more maneuverable and can hover, result in higher counts. Elk populations in the Gardiner area are the bread and butter for some local hunting outfitters. In 2016 FWP made regulation changes to try to boost the bull elk population, much to the chagrin of some locals. Yet the changes seem to be working. The number of older brow-tined bulls is up from 93 to 114, a 22% increase in Hunting District 313. Inside the park that number has increased from 339 to 410, or about 21%. Based on what this past season’s hunting success shows FWP will decide whether or not to suggest a change in the hunting regulations. Right now, hunters are sacrificing opportunity to help recover bull elk populations. That may be helpful based on one trend that is showing up. “It’s turned into a social question,” she said.